UIL Brings Home the Bling! 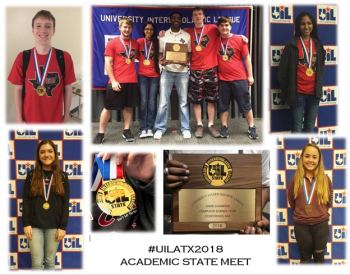 The Chapel Hill UIL Academic program made history on Friday at the State Academic Meet in Austin by bringing home 3 State Championships! In Computer Applications, Divya Mistry was the State Champion for the 2nd year in a row; Zachary Shipp was the State Champion in Computer Science, becoming the first Chapel Hill student to place first in that event; and the Computer Science Team comprised of Zachary Shipp, Riley Perry, Benjamin Swiger and Divya Mistry brought home the State Championship Computer Science team award. Also bringing home State bling, was Jayden O’Briant who placed 2nd in Headline Writing and Kate Matthews who placed 6th giving her back-to-back State placings in the event. Currently, Chapel Hill is in 3rd place as a school, while competing in only 4 events. That is amazing production!! They were great representatives for Chapel Hill, bringing home a total of 8 medals! Congratulations to these amazing students and coaches!